CLIFTON — Students from Schools 12 and 17 filled their school with song and learned new lessons as a part of a national celebration of afterschool programs. On Oct. 23 a combination of the fourth and fifth grade Minds in Motion students performed in the School 12 gymnasium before their peers and a gathering of parents and staff. Minds in Motion, the name of the afterschool program, is funded by the 21st Century Grant, which supports STEM-related (Science, Technology, Engineering, and Math) activities as well as literacy. The federal grant money is awarded per a five year term and entitles School 12 to a $500,000 grant every year to support program resources. The chorus performed a rendition of "Stereo Hearts" by Gym Class Heroes, complete with dancing, and three solo singers with group backup. 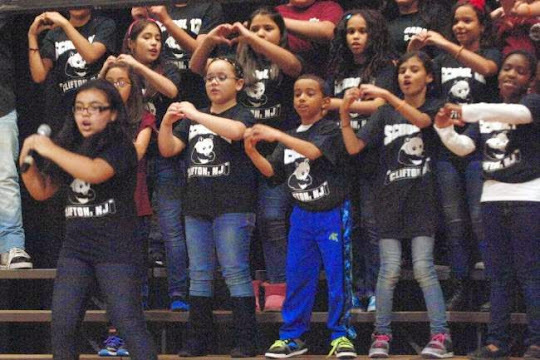 The students learned the song and practiced as a part of the program. The celebration, Lights on After School, placed the spotlight on afterschool programs nationwide, and gave students a chance to show off what they’ve learned. The Minds in Motion program gives students a safe place to go after school, where they can do homework and take a variety of special classes. Students in the program are also supplied with meals and participate in field trips. School 12 principal, Maria Parham-Talley, said the program was designed to expose students to many different careers related to STEM. A show of hands that afternoon yielded many students interested in a career as a police officer, military, firefighter, teacher, or scientist. Later, the gathering of afterschool students accompanied music teacher Dawn Valentine in singing "We Are Here" by Alicia Keys, their arms swaying and hands clapping in time with the music. Parham-Talley asked students what the song lyrics "we are here for all of us" meant. A student replied, "so we can help each other." The district recently completed its Week of Respect, where students learned about the nature of bullying and how to combat it. Students and parents saw a portion of a student-made film, titled "The Power of One," which showed how to be a responsible bystander and help someone struggling in a bullying situation. Parham-Talley said there was "one more treat" in store for the students that afternoon, when a squad of four from Clifton Police Department’s SWAT (Special Weapons And Tactics) team performed a short drill as they came on stage. The SWAT team had also come to speak at the school in January for Public Safety Day. Excited students asked questions of the officers, and the officers shared their stories of hard work and dedication to get where they are today. One shared his story of coming to the U.S. at 14 years old, learning English as a second language, and studying hard to be a police officer. He added the "most powerful weapon" is "your mind and [a] pen." He said with these, people can tell others their story and can teach anyone something new. Another officer said students shouldn’t despair over a poor test grade, but instead "keep trying to get where [they] want to be." He added police officers go to school too, and every year receive additional training. Students were excited to see the equipment the SWAT team brought along, which included a shield, door ram, and pry bar, among others. The officers explained the equipment is there "to protect" and they "train so that bad things don’t happen." Officers explained the use of each of the pieces of equipment. Students were invited to take a closer look and try on a defensive vest. The Minds in Motion program, which is in its second year, is free for registered students. Students enrolled can take a variety of classes after school.